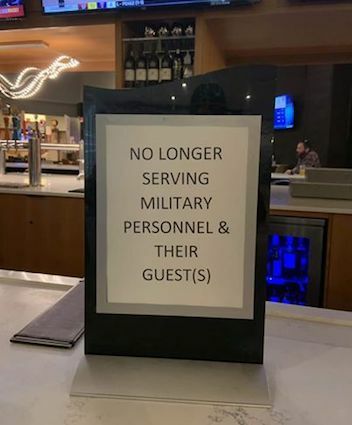 COLORADO SPRINGS, CO. (THECOUNT) — Soldiers celebrating their post deployment at a Colorado Hilton were greeted with a rude placard informing them they were not welcome at the establishment. The DoubleTree by Hilton in Colorado Springs has since posted to its Facebook page an apology Friday afternoon for refusing to serve members of the military at the hotel’s bar Thursday night. A statement from the Daniel Kammerer, General Manager of the hotel, said two employees “acted without the proper authority” to exclude service members from the bar. Kammerer’s statement said both employees are “no longer employed at the property,” reports KOAA. Or drop those two in the middle of Taliban territory and leave them, saying, “We no longer protect you!”. Just go to Hooters. More appreciative wait staff and one hell of a lot more fun. Probably cheaper too. NOT GOOD ENOUGH – WHO were the TWO??? They need to be IDENTIFIED and RIGHTFULLY publicly SHAMED! They also need to FACE the MILITARY that they tried to exclude! This should be considered a HATE CRIME of the highest nature. Letting Crap like this to be swept away with “no longer employed here” is not enough – NAMES and PICTURES of the creeps!!! Smile say thank you and walk away. There are other folks who will gladly serve you. Yeah, the way they phrased that made me wonder about that as well. It could be that these two cretins were just transferred somewhere else because it was easier to do that than actually fire them. Or maybe they were fired and the manager just suffers from a bad case of mush mouth. Liberals have always hated the military. They always will. Any conservative employee doing anything remotely pro-conservative on the job and 1/100 as offensive would have been doxed from Alaska to Florida by the lefty media. “no longer employed at the property” At another property? I’m looking around the internet, but haven’t found an answer to the question of “why?”. More to come on this story hopefully. Has anyone mentioned “Why?” the employees thought Military personnel should be banned from this bar ?